Tomorrow is Christmas. How insane is that!? I have been shopping since September and been ready for weeks but I am still shocked at how fast it came. I found this survey online and thought it seemed fun. I love learning about how other people celebrate holidays so I thought I would share some of my favorite Christmas things. 3. What do you eat Christmas day? -At my parents house we always eat tamales. At my in-laws we usually have ham or something like that. 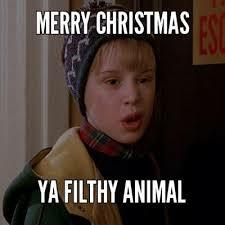 - At some point leading up to Christmas, The Husband and I watch Home Alone and Home Alone 2 while eating a cheese pizza. 5. Sleep in or wake up early? - I have always been an early riser and Christmas is no exception. 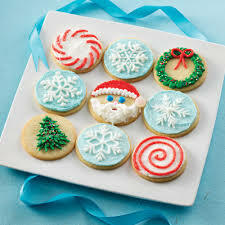 - I am big fan of sugar cookies during the holidays. I also love my cinnamon roll cake (biased, I know). 7. What's the weirdest gift you've ever received? - I once received a collection of Betty Boop stuff. A shirt, earrings and a poster. I was 27 and had never once mentioned that I liked Betty Boop. 9. Dress up or casual? 10. Do you open gifts on Christmas Eve or Christmas morning?